Harry joined the H C B the same day as my Grandfather, Horace Jaikens, and they both came from Abbotsley in the then county of Huntingdonshire. Both men left from the village to enlist in the Army. At the time they did not know which unit they wanted to join, but set out for the nearest Recruiting Office. They walked from Abbotsley to St. Neots station where they hid on the train to avoid paying the fare and stopped at Huntingdon, where the guard on the train handed them over to the Station Master, who hearing their story, walked them to the nearest recruiting point which just happened to be the Recruiting Office of the HCB in St. Mary's Street Huntingdon. The both signed up and were given joining battalion numbers. 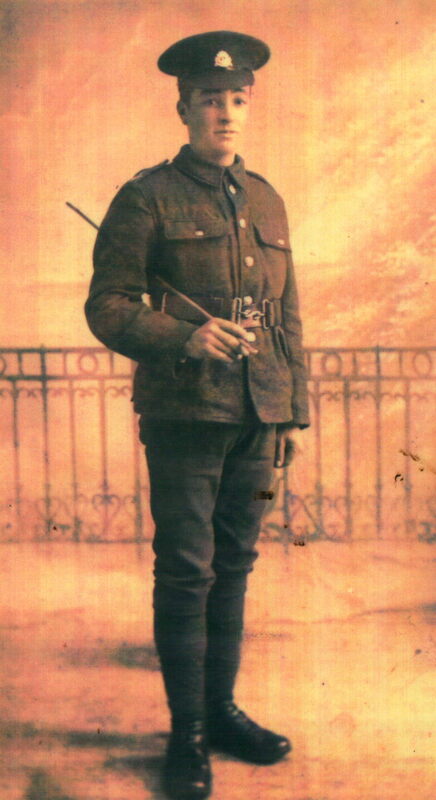 Harry Childerley in the full military uniform of the Huntingdonshire Cyclist Battalions. It is thought that this photograph was taken in early 1915. The background is similar to many photos in the collection, being taken in studios at Huntingdon. 5/9/1916 = The War Office have intimated to Joseph Childerley, of Abbotsley, that his son Harry, of the Royal Warwicks, is missing. Horace, the son of Mr. Jaikens, of Abbotsley, and of the same regiment, is also reported missing. 17/11/16 = Pte. Harry Childerley (Cyclists), of Abbotsley, was killed in action on August 18th, 1916. 19/1/1917 = The War Office has informed Mrs. Childerley, that her son, Pte. H. Childerley (Cyclists), reported missing last August, is now reported as killed in action on August 18th, 1916. 20/7/1917 = Pte. H. Childerley, of Abbotsley, reported missing in August is now officially reported as killed in action on August 18th. He originally joined the Cyclists. Abbotsley man reported missing = It has been reported that the body of Pte. Harry Childerley, of Abbotsley, of the Hunts. Cyclist Battalion, was seen and recognised, but at present no official notice has been issued of his death.. 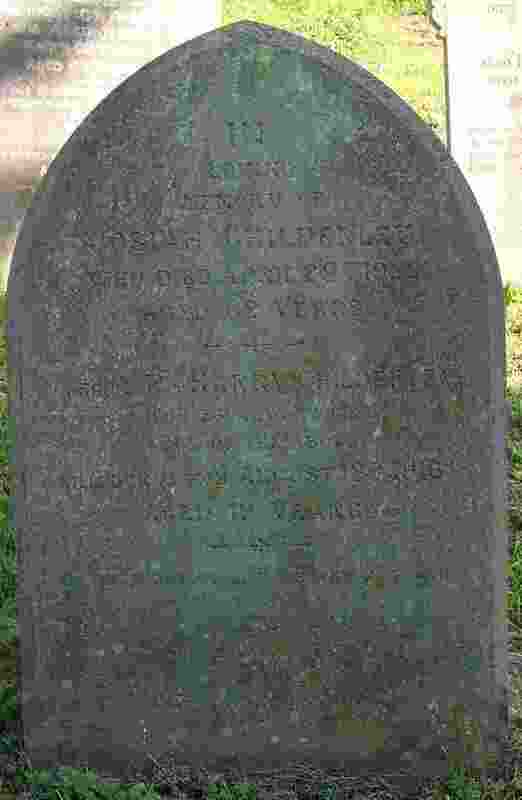 He is the son of Mr. Joseph Childerley. "Private 20769, 1/5th Battalion-Territorial, Royal Warwickshire Regiment. Killed in action 18th August 1916 in France. aged just 19. He was born in Abbotsley, Hunts., enlisted Huntingdon, resident St. Neots. Son of Martha Childerley, of Abbotsley, St. Neots, Hunts, and the late Josiah Childerley. Formerly 1453, Hunts Cyclist Battalion. Commemorated on Thiepval Memorial, Somme, France. Pier and Face 9 A, 9 B &10 B"
He is also named on a memorial in the grave yard at Abbotsley church. CHILDERLEY Harry 20769 1/5th Royal Warwickshire Regiment 18th August 1916 Abbotsley Huntingdonshire 1453 "Private 20769, 1/5th Battalion-Territorial, Royal Warwickshire Regiment. Killed in action 18th August 1916 in France. Age 19. Born Abbotsley, enlisted Huntingdon, resident St. Neots. Son of Martha Childerley, of Abbotsley, St. Neots, Hunts, and the late Josiah Childerley. Formerly 1453, Hunts Cyclist Battalion. Commemorated on THIEPVAL MEMORIAL, Somme, France. Pier and Face 9 A 9 B and 10 B"
The late Pte. Childerley, of Abbotsley. Dear Mrs. Childerley, - I am just writing to let you know how sorry we all were at the sad death of your son. He was killed instantly on August 18th, near, Ovilliers, in a very fine and successful attack by this Battalion. I was not on the spot at the moment. the officer he was with was also wounded, and it was not known at first what had become of your son, but I am afraid there is no doubt that he was killed instantly by a shell while going over open ground. He was a man who had made a very good impression on all who knew him, even in the short time he was with this Regiment. I am told that he did very gallant work with a machine gun, remaining at his post with it at one point till the Germans were right upon him. It is my misfortune that I cannot tell you in the words of an eye witness, but hope I may offer yum my deepest sympathy in so great a bereavement. Yours very sincerely, C. E. Carrington, Lieut. B E F.
In ever loving memory of our darling boy, Private Harry Childerley, who was Killed in Action August 18th 1916, aged 19 years. That within our hearts are sealed. As when in Christ he fell asleep. From his loving Father, Mother, Brother and sisters. Childerley, - In loving memory (on his 21st birthday, June 21st) of our sadly missed boy Harry (Hunts. Cyclists, killed in action August 18th, 1916. Never forgotten by his Mother, Father, Brother & Sisters - Abbotsley. Childerley, - In ever loving memory of our dear son and brother, Pte. Harry Childerley, of the Royal Warwicks, Killed in Action August 18th, 1916 aged 19 years. God in His mercy took him to rest. From his Father, Mother, Brother & Sisters - Abbotsley.